Based on Academy Award ® Winner Akira Kurosawa's 1961 masterpiece, Yojimbo - George Kodama is a pretty intelligent tough guy investigating an incident that occurred in the small town of Kimujuku over 15 years ago. However, the local town folk have been feeling a bit uneasy since the arrival of this wandering stranger. George is soon caught up in the middle of a bloody gang fight as both groups fight for overall control of the town. Amidst the fighting, shootings, and deadly alliances, will George find the clues to his mystery or will he find himself face down in a body-bag? 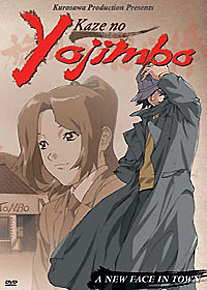 DVD Features: EXCLUSIVE mini-animation cel and Trailers.